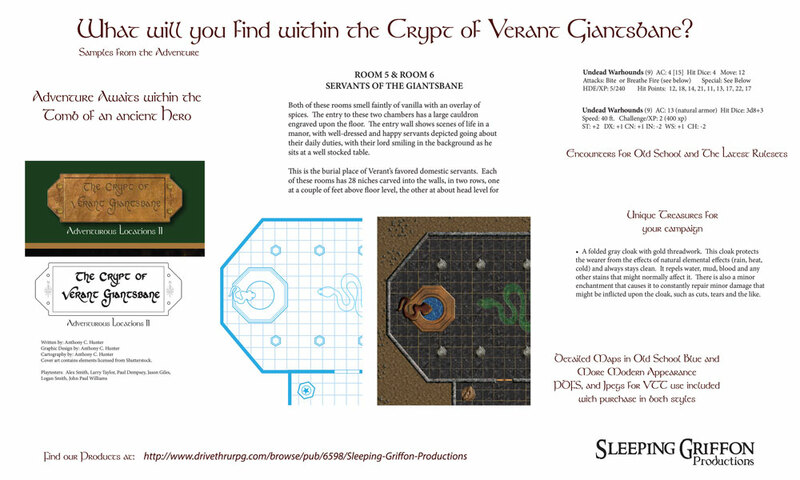 I've released a new adventure over on DriveThruRPG, The Crypt of Verant Giantsbane. It is a fantasy adventure location, describing the tomb of a hero of a past war. Fortune and Glory await the intrepid adventurers brave enough to venture into the depths of the Crypt. Below is a sample of what can be found within the adventure. Your purchase will get you the 43 page pdf adventure, with descriptive text and old school style maps. In addition, you receive pdfs of the maps in both old school blue style and a more modern style. VTT ready jpegs are also included in both mapping styles. This adventure is designed for characters of 4th through 6th levels, with statistics compatible with both old school rules and with the latest iteration of the top tabletop game and is easily converted for use to other systems.